Find out about classes and events for A Block Away Quilt Shop. 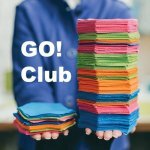 Meeting monthly, we will utilize our AccuQuilt GO! cutting system to cut the pieces to make amazing quilt blocks. Join this quilt of the month club that has been designed to use the fabric in your stash!